Southern California Edison Company is the owner of power dams on the Rush Creek series of lakes, Alger, Gem and Waugh Lakes. In 1977, the company made plans to repair the uppermost dam located at Waugh Lake in the Minaret Wilderness Area. The elevation of Waugh Lake is about 9,500. 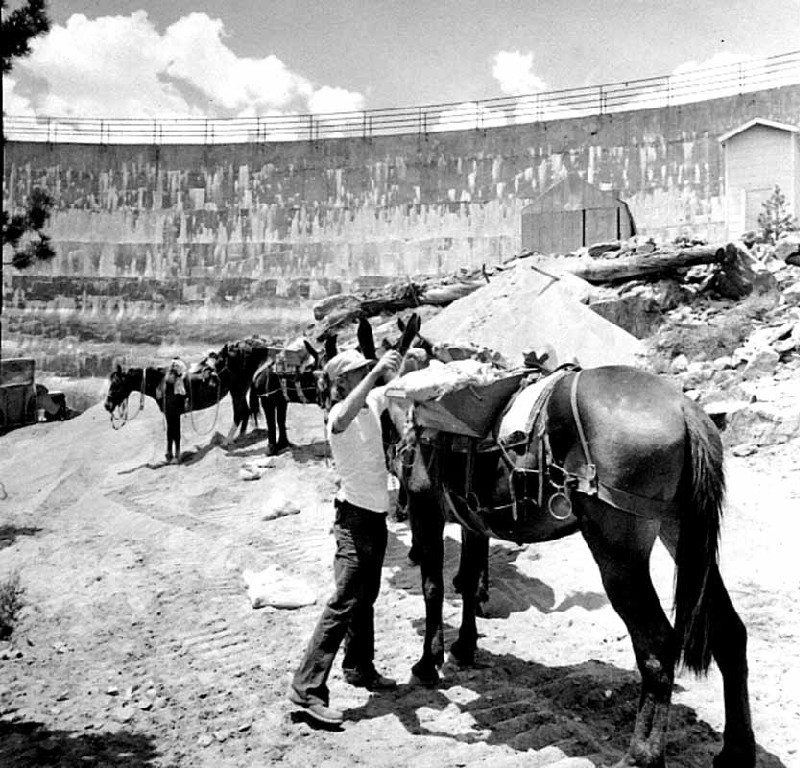 The repairs to the face of the dam required 500 tons of sand and cement at the dam site. Because of provisions of the 1964 Wilderness Act, the Forest Service would not issue a permit for the material to be transported into the site by helicopter. The hauling of sand and cement had to be accomplished in time for the project to be completed before winter’s cold weather prevented concrete work to continue. Packers with strings of sturdy pack mules could be used to provide that service. A contract was signed between Southern California Edison Company and three pack stations: Frontier Pack Station, Red’s Meadow Pack Station and Rock Creek Pack Station. The three contracting pack stations plus Leavitt Meadows Pack Station, Mammoth Lakes Pack Outfit and McGee Creek Pack Station agreed to haul the sand and cement to the storage site located at the dam. The contract had to be completed in ninety days. 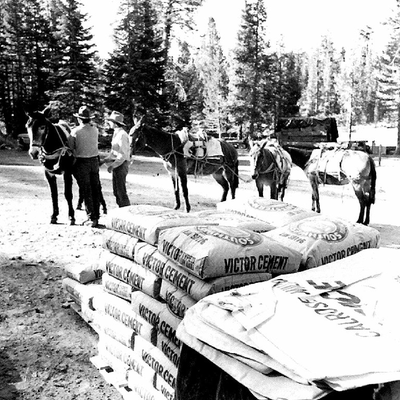 Each of the six pack stations contributed packers, pack mules and horses. The two stations closest to the dam site were the designated loading areas – Frontier Pack Station at Silver Lake, elevation 7,225 feet, and Agnew Meadows Pack Station at Agnew Meadows, elevation 8,300 feet.. Sand and sacks of cement was trucked to these two stations. The cement was already sacked but the sand was in bulk piles and had to be sacked at the staging centers. A ground crew at each loading site filled and weighed the sacks of sand. Special pack bags were constructed that would accommodate the sacks of sand and concrete. Each sack, holding sixty pounds of sand, had to be bagged and weighed by hand and four sacks were loaded on each mule. 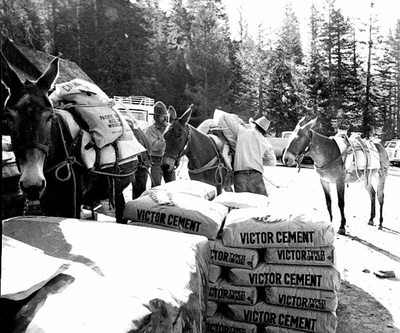 The cement, in ninety-six pound sacks, was loaded two sacks to a mule. Ten mule strings of five mules each were loaded at each departure site early every morning. Some days, as many as fifteen strings made the trip. From Silver Lake, using the steep and hazardous Angels Flight Trail, it required a seven-hour round trip, not including packing and unloading time. From Agnew Meadows, it was an eight-hour trip via the John Muir Trail plus time to pack and unpack. Pack stations, other than the local stations, kept their stock at the departure corrals. Packers commuted back and forth from the departure location to their individual pack stations and carried their slickers with them daily. Many young packers really learned packing skills that summer. The days began early and ended late. Pack station cooks prepared early breakfasts, packed lunches and stayed late in the kitchens to provide late dinners for returning tired packers. At the Waugh Lake dam storage site, over one hundred mule loads were unloaded each day. Altogether, over 4,000 mule loads of sand and cement were hauled over steep, precipitous trails by sure-footed mules to the unloading site. 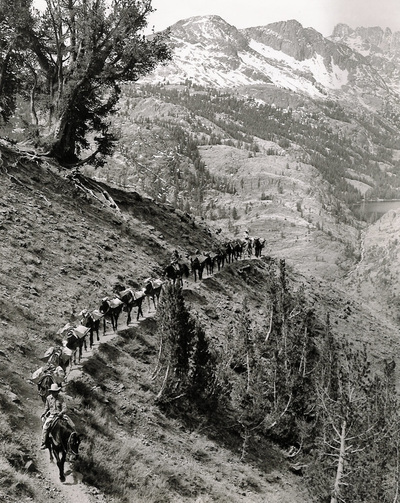 Over 100 mules and packhorses were used and had to be re-shod every four weeks because of the rocky granite trails. There were some wrecks along the trail but with no serious injuries, and all of the mules and horses, and their packers were still working at the end of the project period. Even though it was a wet summer with many thunderstorms and rainy days, the contract was completed in seventy-four days. The dam was repaired that fall. All of this activity had to be worked around the normal busy summer season with scheduled visitor pack trips. Owners dealt with complicated logistics. When packers get together to relate packing tales, this mighty effort by men and mules and horses is still talked about over coffee.